We’ve been time traveling again. We even packed our kit in our TARDIS to get there (I mean, I knew we were buying a big car when we got the VW van, but ye gods, the amount of stuff we can fit in there is incredible! It really is bigger on the inside). 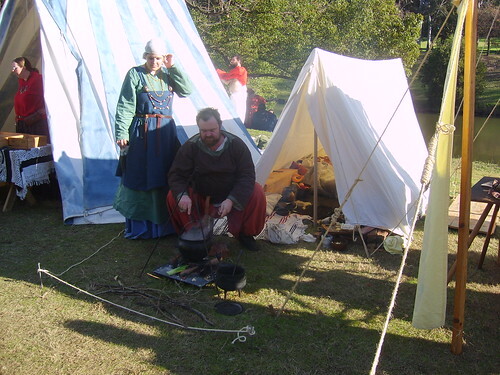 Our weekend was spent at the Winterfest Medieval Fair at Parramatta Park being part of the living history display. I wove bits of wool and melted bits of glass and watched jousting. Adam did some wood turning on the pole lathe and helped one of our new group members get started on making a pair of shoes. We had a scrumptious lamb stew for Saturday night dinner cooked by Adam and Jess over the camp fire. The kids beat each other up with our collection of rubber weapons and did a little bit of wood carving and pottery. The very lovely Deb (aka Oonagh), from Canberra, was brave enough to come and stay at our place on Friday and Saturday night (we didn’t camp over, it was easier to come home and besides, the cats like it better if they get fed) and she brought me the new linen underdresses she has made for me because she is awesome and actually likes to sew. Unlike myself, who, although I’m assured I am awesome in several ways and incidentally can sew, hates doing it and therefore doesn’t. And I failed to take even one single photo. ETA: But luckily other people did. You know, sometimes not bringing the camera with me is freeing. It allows me to just enjoy without feeling pressured to get all the right shots. It's so funny that you're writing about Winterfest and it's going to be 90 degrees here today. Gotta love the WWW! Happy Winterfest! Sounds like a great thing. As you know, we've just had Summer Solstice here, but I didn't get to celebrate because I am forever swamped with work. But vacation in a week and a half….! I had good intentions for each day, but others convinced me it would be freezing cold!! Your description does make the event come to life in a way. I really think it is so awesome that as a family you have something so special to do together. Yay for other people sewing! I felt so privileged to be seated in front of your tent with the display. To have photos that have no obvious signs of the current age in them is rare. you are welcome to use the photos from my facebook or flickr account ( http://www.flickr.com/photos/oonaghsown/ ) I didn't get many, but there are some nice ones and some angles that you wouldn't normally get. Thanks for helping make my time up there even better. I was sure you would include a picture or two. I will just have to use my imagination.